Vitamin B12, also known as cobalamin, is a water-soluble vitamin that plays an important role in our health. Vitamin B12 has a critical factor for the normal functioning of the brain and nervous system and the building of red blood. It is also important for energy levels, DNA synthesis and is involved in the metabolism of every cell in our bodies. Vitamin B12 deficiency is one of the more common vitamin deficiencies. A vitamin B12 deficiency usually occurs as a result of a combination of a variety of factors. One of the most common causes is a vegetarian diet. Why You Haven’t Enough B12? A main source of vitamin B12 in our diets is from red meats so it is somewhat common for a vegetarian to have this deficiency. Another common cause of vitamin B12 deficiency is poor digestion and assimilation. Aging also increases the risk of a B12 deficiency. Alcoholics, people with malabsorption or dementia also may be low in their vitamin B12 levels. The body is able to store this vitamin, so a deficiency may take several years to happen. Vegetarians are much more at risk of a vitamin B12 deficiency compared to meat eaters. If a meat eater is deficient in B12, it is most often a result of a problem with the absorption of the vitamin. How Deficiency B12 Will Affects on You? 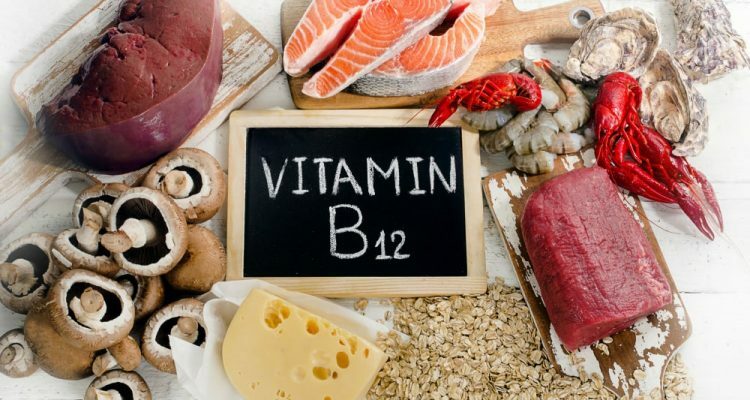 The majority of the vitamin B12 deficiency symptoms will affect the number of red blood cells, the nervous system, energy levels and the state of mind. Vitamin B12 maintains the normal electrical conductivity through the nerves by nourishing the myelin sheaths which are over the nerves. If there is a lack of B12, decreased sensory perception is common along with sore arms and legs and a difficulty walking or talking. A vitamin B12 deficiency can lead to folic acid and melatonin depletion. Low levels of folic acid will increase the risk of arteriosclerosis by elevating homocysteine levels. Low levels of melatonin can bring on insomnia or frequent waking which also brings on other health problems. Where to Get B12 in a Quick Way? To treat a vitamin B12 deficiency it is important to supplement vitamin B12 either orally, or in severe cases by vitamin B12 injections. For most people, only 10-20 mcg a day is a good insurance dosage to ensure proper vitamin B12 levels. For some, doses of 500-5,000 mcg are taken to relieve fatigue or to help prevent pernicious anemia. Some people do benefit from the vitamin B12 injections to treat a variety of symptoms ranging from low-energy, pernicious anemia or certain mental conditions. On occasion vitamin B12 is recommended for weight loss. However, when there is fatigue or anemia, it is a good idea to see your doctor to find out if you have a vitamin B12 deficiency.